William Jennings Bryan writes to Woodrow Wilson about a pending peace treaty with Mexico and other nations. I have a piece of news so good that I can not postpone its communication until Monday. 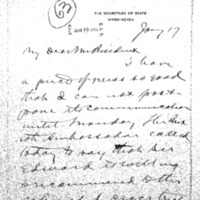 The British Ambassador called today to say that Sir Edward is willing to recommend to the cabinet a peace treaty along the lines of the Netherland treaty provided the investigation provided for is made without the necessity of submitting each request for investigation to the Senate in advance of the investigation. If it were necessary to consult the Senate in advance of each investigation they would have to provide for some similar formality on their side. I told him that as I understand it section three (enclosed) contemplated a permanent commission which acts either on its own initiative or at the request of either party without the formality of action on the part of our Senate. This is only possible however because each party reserves the right to act independently after the report is submitted. While I am sure this is the intention of the treaty I submit it to you for approval before giving him the assurance asked. With Great Britain ready to sign I feel sure of France at once & of Germany later. Bryan, William Jennings, 1860-1925, “William Jennings Bryan to Woodrow Wilson,” 1914 January 7, WWP18287, First Year Wilson Papers, Woodrow Wilson Presidential Library & Museum, Staunton, Virginia.